While coping with the day-to-day life of being on dialysis, I keep my chin up by following the progression of Kidney Project, a research effort that lends hope to the thousands upon thousands of us tethered with end stage renal disease. Just how much hope that someday many of us may be able to rid ourselves of dialysis altogether is yet to be determined. Any hope at all for many of us, though, makes treatment days at a mundane dialysis center that more tolerable. 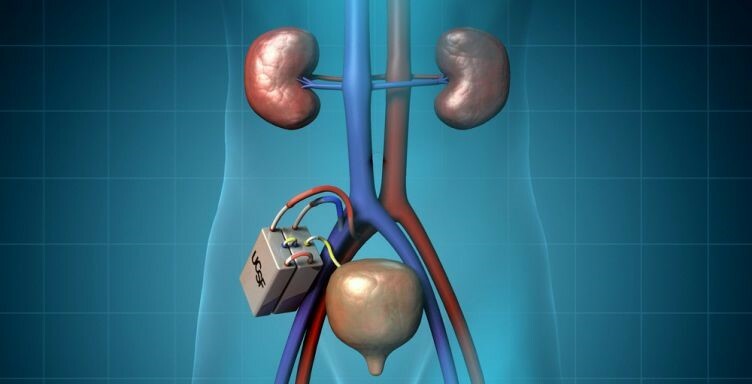 For now, the measure of this hope is in the hands of those who are working in collaboration to create an implantable bioartificial kidney that likely will alter the lives of ESRD patients. When the day comes that turns hope into reality will no doubt vastly impact the renal disease industry. In my recent book – Dialing in on DI-AL-Y-SIS – I devoted a chapter toward several areas beyond current traditional treatment options that might provide needed hope for renal disease patients. Kidney Project was one research effort that offered some in-depth information. A post a week earlier addressed how the bioartificial kidney device works, and how big the device really is. In May of 2017, the project’s two front-line doctors – Dr. Shuvo Roy of University at California San Francisco and William Fissell at Vanderbilt University – were quoted on how the success of Kidney Project can carry such an impact. Whenever the hope of Kidney Project becomes a reality, the materialization of such a breakthrough has been promised help by the U.S. Food & Drug Administration. The FDA has selected Kidney Project to a new regulatory approval program called Expedited Access Pathway. EAP is intended to bring breakthrough medical device technologies to patients faster and more efficiently. From the viewpoint of we treatment patients, Kidney Project success can come as soon as tomorrow. This very cold month of January (2018) will conclude my first year of being on dialysis. I am not looking at month’s end as a time for celebration; there are no plans for a party in behalf of surviving one year in partnering with Count Dracula, the name I have given my dialysis machine. Rather, I consider the month’s end as more of one as recognition – a time to acknowledge that my life likely has been prolonged. And done so by a process that three times a week circulates the 10 or 11 pints of my blood, while methodically filtering it each treatment day (about three complete cycles) in removing any excess fluid and cleansing the bloodstream of any bad-boy toxins. As a result, I generally feel pretty good going into and coming out of dialysis, along with the time in between. Maybe that is reason for celebration. What I do savor about the past 12 months are the conversations with fellow end stage renal disease patients, and several of the people who I have become acquainted with in doing research for my new book titled Dialing in on DI-AL-Y-SIS and some others who fall into the category of book writers. Among the latter are World Series baseball champion Ed Hearn, University of Cincinnati professor emerita Angelene J. Hall, and noted kidney disease advocate Jim Dineen. ** I have known of Ed Hearn since he was a member of the 1986 World Series champion New York Mets, and soon after involved in a trade that took him to the Kansas City Royals, my favorite team ever since the team’s inception in 1969. Hearn, whose lengthy Minor League run (eight seasons) but very brief Major League stint was shortened by injuries, was featured in a chapter of my book. Following his baseball career, he endured medical struggles with several very serious diseases – chronic renal disease that forced him through years on dialysis followed by three kidney transplants, a life-threatening sleep disorder, and battles with carcinoma, a type of cancer that requires radiation and a multitude of prescribed pills. The Florida-born Hearn in 1996 wrote a book titled Conquering Life’s Curves that I discovered while researching my book. I ordered a copy of Ed’s hardcover offering and found it to be an uplifting find. It took me only one overnight read to finish it, and soon thereafter I enjoyed a memorable telephone chat with him, the first kidney transplant recipient I had ever indulged in conversation. In the past couple of decades, Hearn has become one of the top 10 inspirational speakers in the country. ** I came to know of Angelene J. Hall just this past holiday season when my second-oldest daughter, Erin Gilmer, provided me with a book receipt in a festive bag beneath our modest window-box tree. The thoughtful reading titled Duck Summer was en route, arriving a few moons after Christmas Day. Angelene’s interesting book chronicles her six-year odyssey on dialysis that preceded her eventual kidney transplant in 2004. After reading Hall’s book, I was able to connect with her by telephone. She still resides in Cincinnati, and Summer Duck, her most recent literary writing, represents her efforts in using her experiences with ESRD to educate the public about renal decline and ultimate failure, dialysis treatment, and the urgency of organ donation. ** Even more recently, I have had an occasion to hook up through Facebook and by email with dialysis patient/kidney transplant recipient Jim Dineen. The West Chester (Ohio) former steel industry manager penned a poem titled Those Who Go, Those Who Stay that appears in my book as a very appropriate presentation. Jim wrote the poem in 1990, when someone asked him about his experiences during the Vietnam War. His daughter, Shari, then painted a picture for him using his poem as her inspiration. The picture has the same title and depicts a Vietnam veteran kneeling at “The Wall” memorial in Washington, D.C.
Dineen was diagnosed with kidney failure in 1998. After three years on dialysis, he received a kidney in November of 2003 from Joyce, his wife of more than 40 years. In June of 2004, their story was featured in Readers Digest, focusing on how kidney disease dramatically affected their family and brought them together. In addition to his poetic prowess, Dineen has authored two books – one titled Life’s Just Not That Complicated and another titled Stand Up, SPEAK! He also since his transplant has dedicated hours upon hours of time and effort as a spokesman for kidney disease at various levels of advocacy. Then life for me continues a dream …. Bear with me a moment, here’s what I mean. Life’s really not cruel, it just has some pain. Give them something to make their hearts sing. No questions asked, simply planting the seed. Look around you, my friends, those folks are us. Are we splitting hairs on ideal body weight? A post shared by noted Facebook kidney disease advocate James Myers caught my attention regarding Ideal Body Weight. Many dialysis patients such as myself take a serious approach to keeping our scale weight into the close vicinity of our dry weight. I know that I do on a daily basis. My actual height is 5-feet, 8 1/2-inches. My scale weight has fluctuated between 164 pounds to 168 pounds over the past seven to eight months, ever since I was placed on dialysis on February 1 (2017). The Ideal Body Weight chart has me, a male, using a midway point between 5-foot 8 and 5-foot 9, which would set my Ideal Body Weight at 157 pounds or 71.2 kilos. My dry weight has been established by my treatment clinic doctors and staff at 76.5. On many treatment day weigh-ins the scale reflects figures below the dry weight level; therefore, on many occasions Count Dracula (the dialysis machine) has little or no excess fluid to draw on. That leaves my three and one-half hours of treatment relegated to only circulating my blood in removing those bad-boy toxins. On several occasions, nurses and technicians have suggested lowering the dry weight level, which likely would call for more frequent drawing of excessive liquids. I balk at that notion. Why? I perceive myself as being too skinny as it is. With the exception of the first six weeks of dialysis, when my scale weight of more than 200 pounds was brought down to 163 pounds, I have come to dialysis feeling good, and I leave dialysis feeling good. My monthly lab work consistently falls within the parameters desired by my dietician and by the Kidney School’s charts that provide an understanding of lab results. Even my heart doctor has encouragingly cleared me to resume playing tennis, when and if we ever enjoy much better outdoor weather. So far, even the doctors at Premier Dialysis where I receive treatments three days a week, the lowering of my dry weight has become a mute topic. Since my stamina remains constant, evidenced by my wife (Maureen, the chauffeur) and I on occasion leaving my treatment center for a restaurant meal, or to walk the aisles at a grocery store for a basket full of sustenance. Hopefully, I will discover that my stubbornness over lowering my dry weight is just a matter of splitting hairs. Or maybe I just need to grow a couple of inches while maintaining my current weight fluctuation. 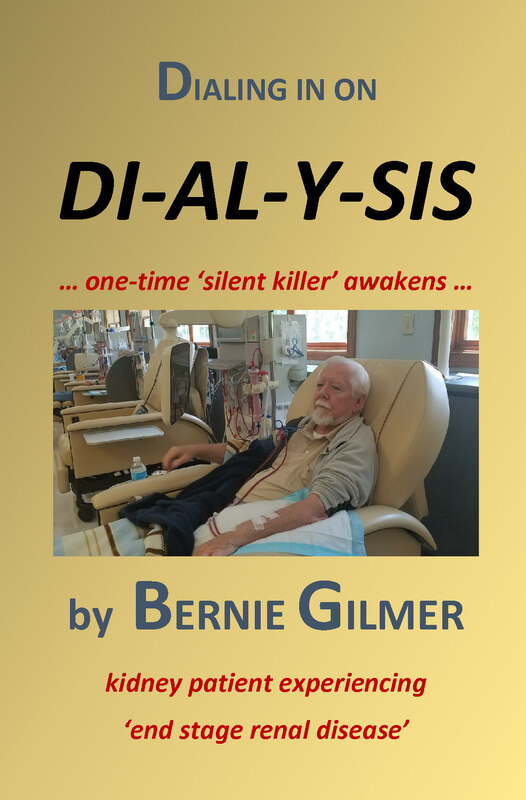 https://www.diodialysis.com/wp-content/uploads/2017/10/logo.png 0 0 Bernie Gilmer https://www.diodialysis.com/wp-content/uploads/2017/10/logo.png Bernie Gilmer2018-01-06 11:53:402018-01-06 11:53:40Are we splitting hairs on ideal body weight? 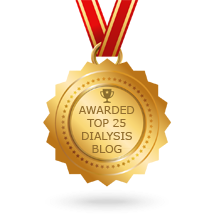 Notification was received early on Tuesday morning (January 2) that blogs written by Indianapolis (Indiana) author and renal disease patient Bernie Gilmer and his diodialysis.com website have received recognition by the international Feedspot organization. The posts also have appeared on his personal Facebook page and his Dio Dialysis Co. dialysis Facebook page. Founded by Anuj Agarwal, Feedspot’s most recent list published on feedspot.com/dialysis blogs/ places diodialysis.com/blog in the No. 13 ranking. According to a Feedspot news release, the list of Best Dialysis blogs is developed from reviewing thousands of top dialysis blogs in the organization’s index using search and social metrics. These blogs are ranked based on the following criteria. Google reputation and Google search ranking. Influence and popularity on Facebook, twitter and other social media sites. Feedspot’s editorial team and expert review. The Feedspot’s listings are refreshed weekly.